Experienced professional specialized in developing innovative and disruptive marketing campaigns that push the boundaries of technology, design, culture and advertising. Extensive background in defining and broadening creative vision and strategy, leading in-house and external agency teams focusing on all facets of marketing, which include long from and short form original and branded content, social, publicity, media and partnerships. Lead creative discussions between Studio Executives, Filmmakers, Talent and Brand Partners. Communicate creative vision and strategy across various departments to ensure consistent execution. Drive ideation and brainstorming sessions with digital and traditional marketing stakeholders. Focused on brand cohesion, innovations and current digital trends. Hands-on approach with a solid history of mentoring and providing leadership to team members. Extremely passionate about creating exceptional work, growing relationships and elevating the culture. Bringing Creative Strategy back to Media. Experience presenting and working closely with Filmmakers, Talent and key Fox Executives to ensure that both the film’s strategic needs are met, while also delivering on key aspects of the Filmmakers’ vision. Spearhead the creative strategy and execution for over $100MM+ annual digital media spend, working closely with key partners including Facebook, Snapchat, Instagram, YouTube, Apple, Vice, Musical.ly, Twitter and Spotify to develop immersive new experiences leveraging first to market platform enhancements and product features. Develop campaign executions that generate organic buzz and publicity with key partners, such as NASA, Amazon, NatGeo, NY Times, Google, Ubisoft, Brown-Forman, Comic-Con, and Reddit. Identifying and manage advertising and entertainment agencies, creative talent and influencers for individual film properties. Working closely with all stakeholders to ensure that the results and experiences were balanced and successful. Creation of Storytelling and Publicity-driven short and long form video content. Managing all aspects from storyboarding, copywriting, production and directing special shoots with film Talent and sourcing talent for original content pieces. Lead on social campaigns that encourage interaction, growth and generate awareness throughout the duration of the marketing window. Established and maintained strong relationship with divisions to develop cohesive campaign strategies internally/externally including Production, Creative Advertising, Creative Content, Media, Exhibitor Relations, Music, Franchise, Home Ent., Events, Gaming, Promotions, Publicity, Book Publishers and Record Labels. Deadpool Franchise, X-Men Franchise, Wolverine/Logan Franchise, Alien Franchise, Planet of the Apes Franchise, Kingsman Franchise, The Martian, Peanuts Movie, Greatest Showman, The Revenant, Hidden Figures, Gone Girl, Book of Life, Die Hard Franchise, Diary of a Wimpy Kid Franchise, Dreamworks and Blue Sky Films. Creative Lead on all Heavenspot projects with responsibilities of overseeing Creative, Production, Time, Budgets and Hiring. Worked hand in hand with the sales team and successfully expanded the business portfolio from Entertainment to Internationally recognized Fortune 500 brands. 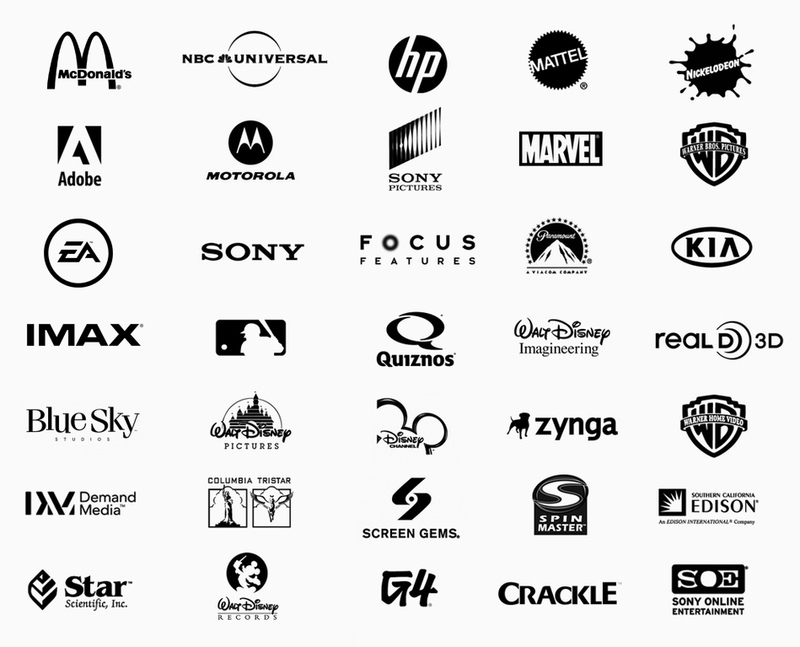 McDonalds, Adobe, Motorola, Marvel, Hewlett-Packard, Mattel, Walt Disney Pictures, Walt Disney Imagineering, Walt Disney Records, Warner Brothers Pictures, Warner Brothers Home Entertainment, HP, Quiznos, Demand Media, Electronic Arts, 20th Century Fox, MLB, Nickelodeon, Sony Pictures Entertainment, Sony Online Entertainment, Spin Master, Yahoo!, Zynga, Teen Nick, Disney Channel, Star Scientific, Columbia Pictures, TriStar Pictures, Paramount Pictures, Crackle, and Focus Features. Creative Director on over 150 campaigns a year for supporting Film, TV, Home Entertainment, International, as well as in-house start up divisions. Built and managed a team of over 30 Designers, Animators and Developers in what was the largest in house studio team. Additionally was the Internal creative consultant to many Sony Pictures and Sony Corporation of America groups in respects to online, print, and broadcast marketing projects. Led the creative for the world’s first streaming video services for mobile networks in Asia and Europe with deployments in over 45 territories worldwide. Designed and led Marketing experiences and Media supporting Film, TV, Home Entertainment, International, as well as in-house start up divisions. Internal creative consultant to many Sony Pictures and Sony Corporation of America groups on online, print, and broadcast marketing projects. Co-Founded the children line Jeeto! which was a Fine Art and Clothing Company sold internationally from local boutiques such as Kitson to retail department stores such as Nordstroms.